Stylfile: the, er, 'must have beauty accessory for 2012'?! I’d hoped we hadn’t seen the last of 2011’s Apprentice winner, Tom Pellereau. The handsome (what, just me?!) 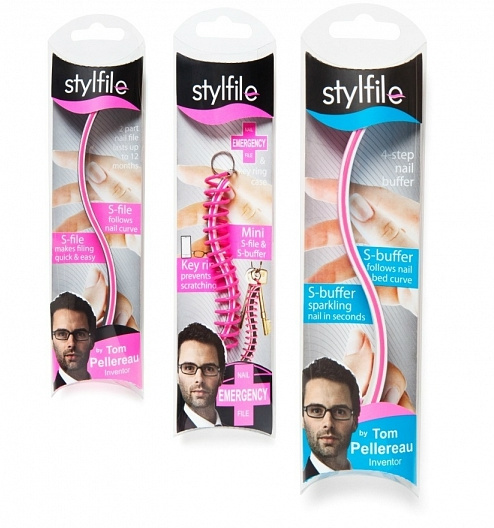 inventor, along with his esteemed business partner Lord Sugar, has just launched the Stylfile*collection, a range of nail files designed with a curved shape to follow the natural shape of the nail. This will apparently make home manicures an easier job, even when using the ‘other’ hand. From next month the range will be available at various outlets including Sainsbury’s, Sally Beauty, Lloyds Pharmacy, Amazon from April and Boots. Check www.stylfile.com for the most up to date stockist information. What do you think, great or gimmick? And any early predictions yet for this year's winner? *Nope, I don’t know why the ‘e’ is missing, either! Wow! I love your post! Thanks for sharing! Yeah I'm a bit confused about this nailfile too. Would love to try it out and see the shape does make any sort of difference...! oh wow, this gadget looks to be much better than the original nail files, would love to try it out! I once received one of those curved nail files in a goodybag and then gave it away. I had no idea how to use it! lol! It definitely makes sense to make it that shape - thanks for sharing! That's an interesting concept! As a short nailed girl, I never needed a special filer, but good to know! BTW to answer your question - Y U No follow me;-), I now follow you! LOL! I came thru ur blog via blog hop! I am following you via GFC and would appreciate if you could check out my blog and follow back! Hope you are having a wonderful day! Thanks for the sharing,see you again. A Stillfile? I'm not so sure, the only files I swear by now are the glass numbers as everything else cause my nails to peel and snap. Ehhh I don't know how I feel about this. I like to move the file and my finger when I am grinding down... I feel like this would just be awkward and ineffective! Don't knock it until you've tried it. I bought one of these early last year and it's great! LOL, the crystal nail files that can be attached to your keychine is awesome! At first I didn't understand what's with the spirals around it.